Copyright © 2013 Xiaohua Wang et al. This is an open access article distributed under the Creative Commons Attribution License, which permits unrestricted use, distribution, and reproduction in any medium, provided the original work is properly cited. This paper first introduces the concepts of mobile operators and mobile sequence, with which it redefines the rate of particle swarm optimization algorithm and the formula of position updating. Combining this discrete PSO algorithm with neighbors, the paper puts forward Hybrd Particle Swarm Optimization Algorithm, whose effectiveness is verified at the end of this paper. The Particle Swarm Optimization algorithm  presented by psychologists Kennedy and Dr. Eberhart in 1995 is a new intelligent optimization algorithm which imitated the behaviors of birds. Compared with others, the PSO has shown its advantages. The PSO is intuitive and easy to realize and has high efficiency in complement. Nowadays, the PSO is widely used in many fields, such as functions optimization, training of neutral network, Fuzzy system control and so on. 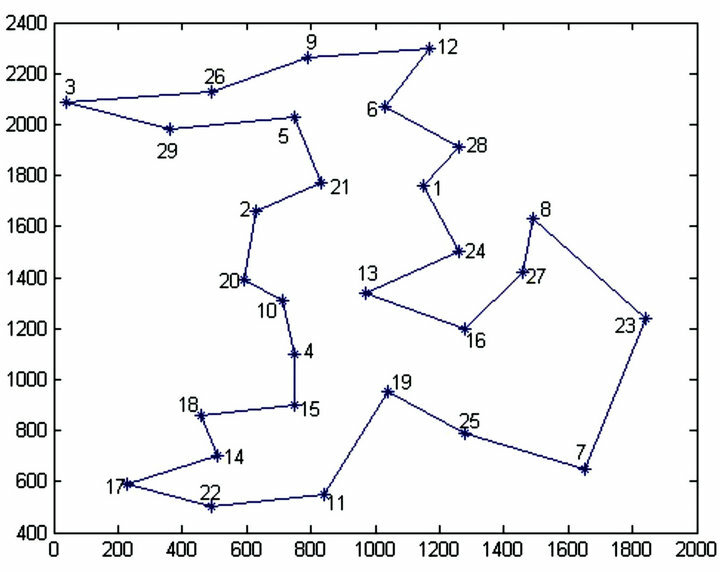 Traveling salesman problem (TSP) is a typical combinatorial optimization problem, which may be described as follows. Given n cities and the distances between every two cities, which is the shortest path for travelling all the cities only once? At first, PSO algorithm as an efficient method is mainly used to solve some continuous optimization problems. However, with the development of PSO algorithm, some experts and scholars began to think how to solve the discrete optimization problems, such as, Kennedy  proposed a discrete PSO algorithm used to solve binary problems in the year of 1997 and he proposed a dynamic probabilistic PSO in 2005 . In addition, some scholars presented the discrete PSO algorithm for solving TSP problem. Clerc  re-explained the velocity and position equation through replacement sequence, and Huang  proposed swapping sequence. Others combined crossover and mutation of genetic algorithm with PSO algorithm , Zeng and Cui presented a new unified model of PSO  which can be used in solving combinatorial optimization problem. This paper proposed mobile operators and mobile sequence for solving TSP problem. The arrangement of this paper is as follows. In Section 2, mobile operators and mobile sequence were defined. In Section 3, the velocity and position equation of PSO were re-explained and PSO algorithm was improved base on simulated annealing algorithm. In Section 4, TSP examples were used to evaluate the improved PSO algorithm, and the conclusions are given in Section 5. Definition 1. 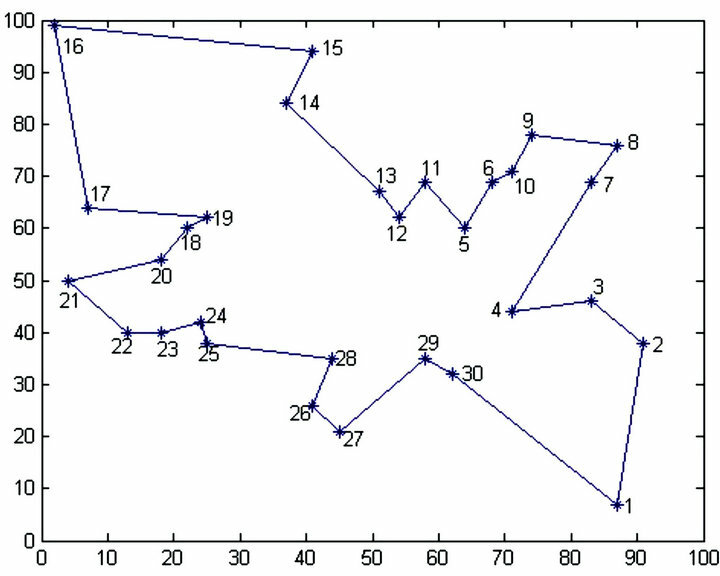 Assuming the solution space of TSP with n nodes be , , and the mobile operator sv(i,k) means the node ni of s moving k steps . If k is greater than zero, node ni moves backward, on the contrary, it moves forward, and it keeps unmovable if k equals to zero. The formula is a new solution after processing by the mobile operator sv(i,k). And the symbol plus is given a new meaning. Because the result of solving TSP is an h-cycle, and and are the same solution actually. If k is greater than zero, node ni moves k steps anticlockwise, otherwise it moves |k| steps clockwise. where are mobile operators, and the order of each operators has the rigorous significance. A mobile sequence is running on a TSP’s solution which means all operators of the mobile sequence are running on the solution one by one. Definition 3. Various mobile sequences running on one solution could bring same solution, all mobile sequences set with the same running result is called mobile sequences’ equivalent set. Definition 4. More than one mobile sequence can be combined into a new sequence, is defined as the combining operator of two mobile sequences. Definition 5. Assuming a mobile sequence , which is made up of n mobile operators, equals to , the length of this mobile sequence is defined as n, i.e. the number of mobile operators. If is one, is called unit mobile sequence. where rand is a random number between 0 and 1. It means, equals to on probability . := social/cognitive confidence coefficients, and are random numbers between 0 and 1. As the PSO algorithm is easily trapped into local optimum in dealing with continuous problems, this paper applies the hybrid algorithm based on PSO to solve the TSP to avoid the same trouble. In each iteration, the PSO algorithm is running firstly, then produces l new positions in ’s neighborhoods by using the simulated annealing (SA) algorithm, compares the fitness of l positions’ and ’s, chooses the best position as and assigns the new position of to a particle as the first particle which is randomly selected. If the same solution is got in m times of iterations, the velocity of all particles must be re-initialized. 5. Determine whether the algorithm has found the same optimal value after m times’ iteration, if the answer is yes, re-initialize all particle’s velocity. 6. Determine whether the stop condition is met. If it’s met, end the loop, otherwise, go to Step 2.
:= the current number of iterations TSP with 14 nodes [4,8] is used to examine the effectiveness of the improved algorithm. Parameters setting: n-the number of particles is 40, the maximum times of iteration is 1000. 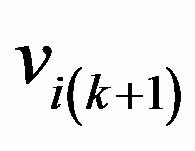 The length of all particles’ velocity is initialized to 1 randomly, and the value of m is 10 as well as l. Weight initialization: , . All feasible solution sequence begins from the first node. We executed the algorithm randomly for 30 times, the results of the experiments are analyzed in the Table 1. The maximum search space of the improved PSO algorithm is 50,000.The search space of  is 200000 and is 4 times of ours, which shows that our approach is more effective. And in all the 30 runs our approach has consistently found the optimal solution, which presents our algorithm convergence rate is 100 percent. Table 1. Results of TSP (14 nodes). of swapping sequence into consideration, it has no identical operator, which means there is no unit swapping sequence can support the equation: . 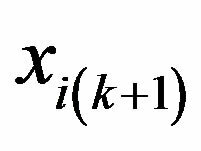 However, the mobile sequence can overcome the shortcoming of swapping sequence with the equation is satisfied in all solution sequence. Therefore mobile sequence is more effective than swapping sequence. For further verification of performance of improved algorithm, we apply the improved algorithm to solving Bays 29  and Oliver 30 . The data come from TSPLIB, the weight decreases from 0.9 to 0.4 during the iteration and the maximum times of iteration is 1500, and other parameters are as same as TSP with 14 nodes. All experiments independently run 30 times and the results are shown in Table 2 and the best solutions of the two plans are shown in Figures 1 and 2. Table 2. 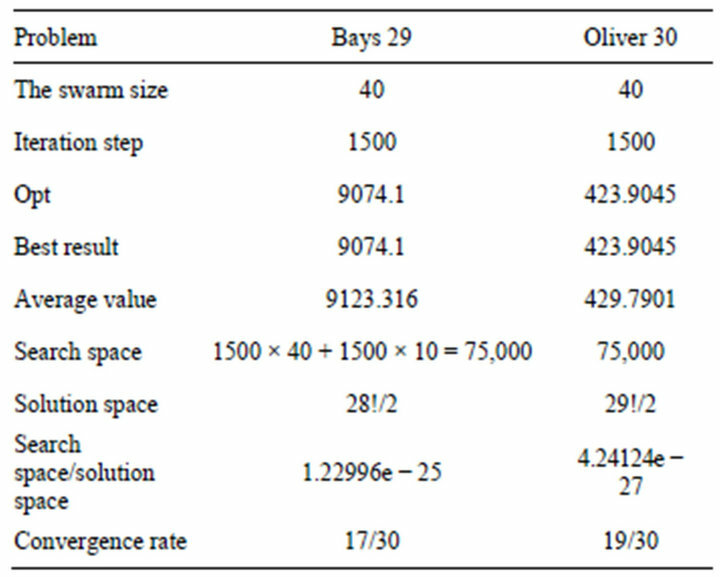 Results of experiments Bays 29 and Oliver 30. Figure 1. The best solution of experiment BAYS 29 with our algorithm. 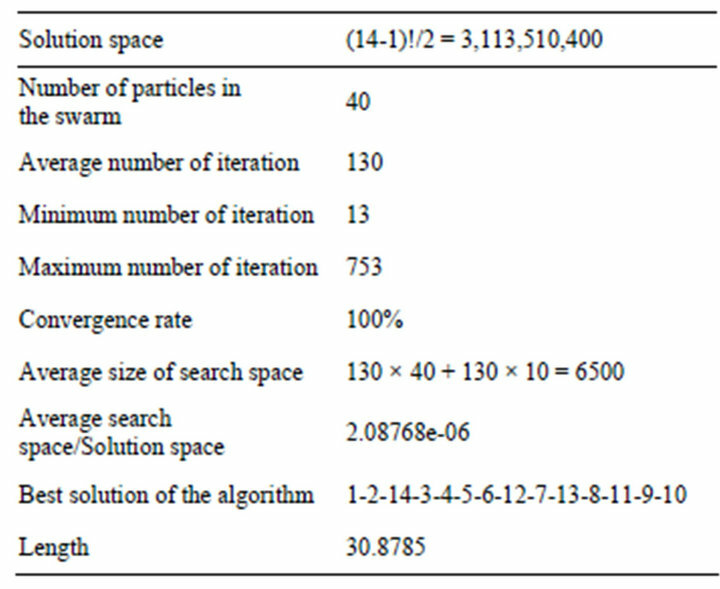 Oliver 30, though the search space versus solution space is small (1.22996e−25, 4.24124e−27). It demonstrates that the improved algorithm has the advantages of small searching area and high convergence rate in solving the small TSP problems, and it is efficient. For comparison, three other artificial algorithms including basic SA, basic GA and Basic Ant Colony Algorithm are used to solve the same TSP problem. All four algorithms are run 20 times for Oliver30, the results are shown in Table 3. Form Table 3, it is clear that our algorithm is better than the other algorithms. For Oliver 30 problem, our improved PSO not only can achieve the best fitness value 423.7405 but also the average fitness value is better than the other algorithm’s. This means our improved PSO is a better and more effective means to solve TSP problem. Figure 2. The best solution of experiment Oliver 30 with our algorithm. Table 3. Results for Oliver30 problem. 1) Using PSO algorithm with mobile operators and mobile sequence is an effective new way to solve TSP. 2) The improved algorithm has the advantages in small searching area and high convergence rate in solving the small TSP problems. J. Kennedy and R. C. Eberhart, “Particle Swarm Optimization,” IEEE International Conference on Neural Network, Perth, 1995, pp. 1942-1948. J. Kennedy and R. C. Eberhart, “A Discrete Binary Version of the Particle Swarm Algorithm,” Proceedings of the World Multiconference on Systemics, Cybernertics and Informatics 1997, IEEE Service Center, Piscataway, 1997, pp. 4104-4109. J. Kennedy, “Dynamic-Probabilistic Particle Swarms,” Proceedings of the Genetic and Evolutionary Computation Conference, Washington DC, 2005, pp. 201-207. L. Huang, K.-P. Wang and C.-G. Zhou, “Particle Swarm Optimization for Traveling Salesman Problems,” Journal of Jilin University, Vol. 41, No. 4, 2003, pp. 477-480. S. Gao, B. Han, X. J. Wu, et al., “Solving Traveling Salesman Problem by Hybrid Particle Swarm Optimization Algorithm,” Control and Decision, Vol. 19, No. 11, 2004, pp. 1286-1289. L.-P. Fang, P. Chen and S.-H. Liu, “Particle Swarm Optimization with Simulated Annealing for TSP,” Proceeding of the 6th WSEAS International Conference on Artificial intelligence, Knowledge Engineering and Data Bases, Corfu Island, 2008. C. Wang, M. M. Zeng and J. Li, “Solving Traveling Salesman Problems with Time Windows by Genetic Particle Swarm Optimization,” 2008 IEEE Congress on Evolutionary Computation, 2008, pp. 1752-1755.